Take your first steps to a great smile with your Northfield dentist! At Northfield Family Dental, we offer Invisalign treatments for adults who want to dramatically improve the look and feel of their smiles. The Invisalign® system is a nearly invisible way of straightening teeth in order for children and adults to achieve the smile they’ve always wanted. 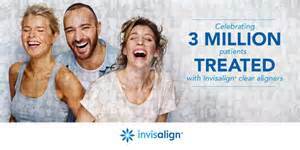 Using advanced 3-D computer-imaging technology, Invisalign constructs your complete treatment plan from the very beginning, outlining the initial position of your teeth to the final desired position. Using custom-made, invisible aligners, Northfield Family Dental provides a way to help you transform your smile without the treatment interfering with your normal day-to-day activities. Unlike traditional metal braces, the Invisalign system provides you the flexibility to eat and drink what you want during treatment by simply removing the aligners. You can also remove the aligners to brush and floss as you would normally, thereby helping to maintain and improve your oral health during treatment. P atients may experience temporary discomfort for a few days with each new stage of treatment. Patients may experience a feeling of pressure on their teeth, which could result in a few minor symptoms of discomfort. However, the pressure you feel is a sign that Invisalign is working to slowly move your teeth into the desired position. Any discomfort you may experience will typically pass after a couple of days. Contact Your Northfield Dentist for Invisalign today! Invisalign offers comfort and convenience and is the only teeth straightening system that allows patients to see in advance what their smiles will look like once their treatment is complete. Don’t wait to achieve your perfect smile – call us today to schedule a consultation!